While Facebook frequently takes heat over privacy issues and continual changes to the look and feel of its website, the social network wants you to know it can also do some good as well - including encouraging users to become organ donors. Facebook introduced a subtle new feature to your profile on Tuesday. But if you blink, you might miss it. 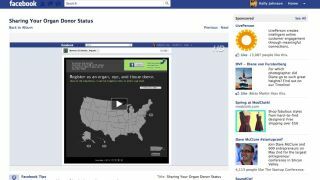 Tucked away among life events in the Health & Wellness section of your Timeline is a new option to become an organ donor, and share your decision with other Facebook friends. Facebook founder Mark Zuckerberg calls the new Timeline feature part of "a life-saving initiative" to create "broader awareness about organ donation." "By simply telling people that you're an organ donor, the power of sharing and connection can play an important role," Zuckerberg explained, noting that 18 Americans die each day waiting for organ transplants that never come. If you're not sure how to get started as a donor, the Facebook link allows users to register to become an organ, eye or tissue donor, then share this proud accomplishment with the rest of your social network. The feature is currently only available for Facebook users in the U.S., who may "Like" this latest addition to one of their favorite social networking sites.